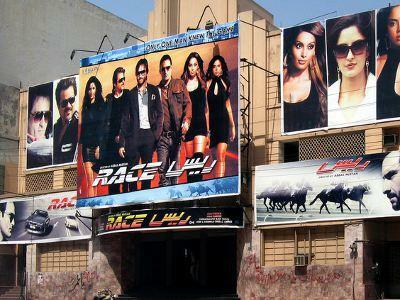 11 Oct – Leading Pakistani newspaper, The Nation, is seeking a nationwide ban on Bollywood films from India in order to help their local film industry to "develop and thrive" based on a demand made in the nation's capital Lahore by a group of local artists, singers and directors, according to a report by the Hindustan Times' website. "There are lots of cinema houses which screen only Indian [Bollywood] movies, and do not show any interest in playing Pakistani movies. The result is a gradual decline of our own film industry," it said. It also warned its readers that, "by not banning Bollywood films being shown in every nook and cranny of the country, we would only be letting the Indians succeed in their ploy of invading us culturally". Previously, there had been a 1965 ban on Bollywood films in Pakistan, but despite the ruling and its failed attempt, Bollywood movies were still rampant in the country until the ban was lifted in 2008. The daily also reported that while theatre owners favour Indian films, due to them being profitable, Pakistani producers are on the opposing end, arguing that Bollywood is killing them. The daily added on that according to a group of Pakistan movie directors, "certain self-seeking individuals associated with Lollywood [Pakistani cinema] are reaping huge benefits by making huge investments in India". "The policy of letting India disseminate its culture freely in Pakistan is dealing a serious financial blow to the Lollywood industry and polluting the minds of the youth," it said.